Many modern buildings require cooling either for the comfort of the occupants or to protect the processes or equipment they contain. 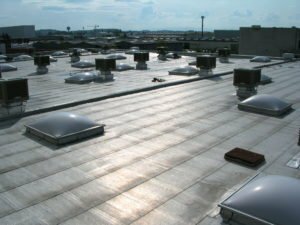 There are three typical methods which can be employed to cool these buildings; ventilation, evaporative cooling or a refrigeration based air conditioning system. The choice of system can have a dramatic effect on the total carbon emissions of the building and the energy consumed due to their different electrical demands. Ventilation systems can provide comfort cooling for most of the year. During prolonged periods of high temperatures, they are unable to maintain internal temperatures below 25°C. Refrigeration based systems are effective but can be expensive to operate and are not carbon friendly. Evaporative cooling can produce air consistently below 22°C in the UK climate, provides an intermediate solution which consumes only a fraction of the electricity. 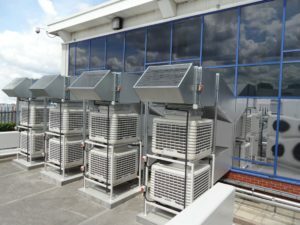 EcoCoolers are used as part of a mechanical ventilation system to provide a cost effective alternative to refrigeration for large buildings. Evaporative coolers have a supply air temperature dependent upon the ambient temperature and humidity. On cool days this is the ambient (dry bulb temperature) and on hot days, when evaporative cooling is enabled, this is close to the ‘wet bulb’ temperature. For more information please see our how evaporative cooling works page. 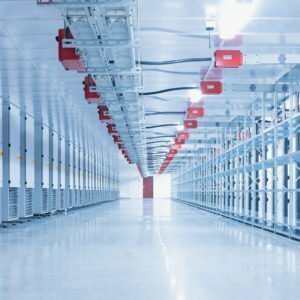 End user applications for this system include: Warehouses, Manufacturing Facilities, Mezzanine Floors, Production Lines, Bakeries, Laundries, Food Processing, Churches, Lecture Theatres. An evaporative cooler alone can result in supply air temperature variation during the day and throughout the year. This can cause issues in some applications such as IT cooling where either temperature variation or low temperatures are not acceptable. To avoid these issues EcoCoolers can be incorporated into a system which uses attemperation. The hot air from the systems exhaust stream is mixed with the incoming cool air to provide supply air at a controlled temperature. A PLC (Programmable Logical Controller) sets the position of dampers to maintain a temperature set point. It also varies the fan speed to minimise energy use. Water use is optimised by evaporative cooling only being enabled when pure ventilation cannot maintain the desired temperature. ECT units are an internal box approach, ECP units must be installed alongside EC Fans and recirculation dampers. Evaporative cooling operates during warm periods to cool external air. During winter periods warm exhaust air is mixed with cold fresh air. EcoCooling describes this mixing process as attemperation. Patented control systems control air flow rate as well as supply and exhaust temperature. End user applications for this system include: Data Centres, IT, Comms, Schools and Classrooms, Lecture Theatres, Gyms and Fitness Suites, Restaurants, Venues, Theatres, Offices, Greenhouses. The ECV range of units consists of a mechanical ventilation unit with attemperation. There is no cooling facility. These products have been designed for buildings where temperatures occasionally exceeding 25°C are not considered to be of significant concern in rooms where free cooling can be used to supplement refrigeration equipment. There is on average 300 days a year in the UK where free cooling can be used to replace refrigeration. Fresh air is brought into the system through EU4 pre-filters. End user applications for this system include: Data Centre Cooling (Arctic Circle and Nordics), Manufacturing Facilities, Production Lines.